Wow, it’s been a while, hasn’t it? First there was Passover, and I posted fewer recipes than usual. Then came my sister’s engagement, pretty soon after passover, and I spent every spare moment making all kinds of outrageously amazing and gorgeous treats for the party. 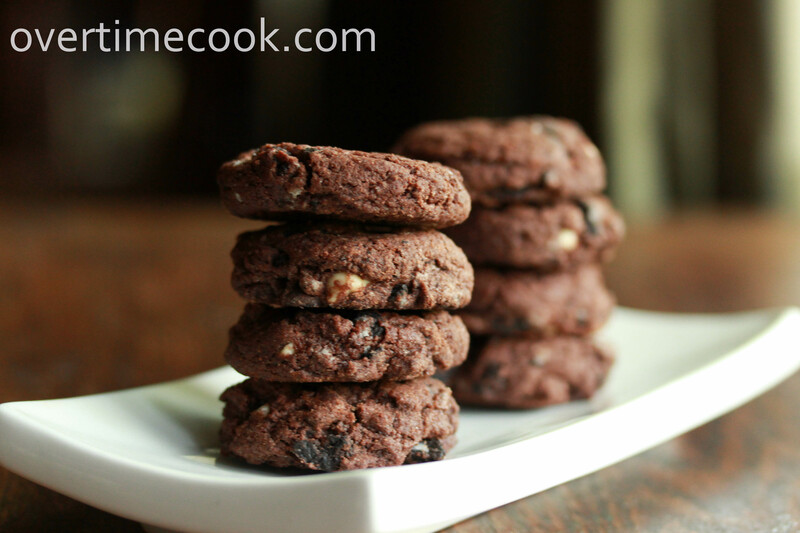 I will be sharing some of those treats with you folks, but first, I am going to share these simple cookies. I made them just before the party, after I panicked that there were no plain and simple cookies for folks who didn’t want my more extravagant treats. I’m not really sure what to say about these cookies. Not because they aren’t amazing, because they are. I’ve made them numerous times. Each time, they were demolished eagerly. These cookies don’t call for all sorts of fancy ingredients. They don’t require any fancy steps. They are simply chocolate-y goodness, simple as that. 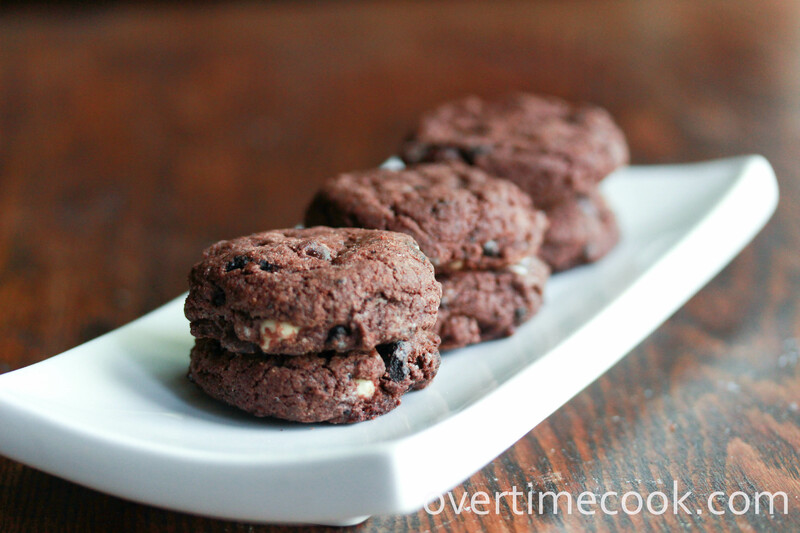 Wondering why I haven’t posted this recipe yet, even though I first made these cookies about 9 months ago? Simple. They’ve never made it long enough to be photographed. Yes. They really are that good. Preheat oven to 375 degrees. Lightly grease or line a cookie sheet. Set aside. In a small mixing bowl, stir together the flour, baking soda, salt and cocoa powder. Set aside. In the bowl of an electric mixer, cream together the butter/margarine, white sugar and brown sugar until creamy. Add the eggs and vanilla extract and beat until combined. Slowly add the flour and cocoa mixture into the mixer and stir until just combined. Stir in the chopped Oreos, white and dark chocolate chips until thoroughly distributed. Scoop the dough with a medium cookie scoop onto prepared cookie sheets. Bake at 375 for 8-10 minutes. Leave cookies on cookie sheet for a couple of minutes to cool before removing them. First – congrats on your sister’s engagement…. Second, so glad you are back! Those cookies look amazing and I think these will be perfect for my dad’s 70th surprise birthday party! Thank you Stacey! I’m sure your dad will love these! Oh he did – but my 11 year old nephew could not keep his hands off of them! Thanks again. Big hit! My pleasure- so glad everyone enjoyed them! Did you try these with a pareve version of Oreo’s by any chance?? If there is such a thing! They look amazing. I actually did make these with Parve Oreos. They sell two non-dairy generic brands in my local kosher grocery store. Btw, I’ve heard from a couple of people that Oreos are actually parve too, but made on dairy equipment. Can these be made with oil instead of the butter/margarine? Thanks! Good question Tova! I haven’t tried it, but I think it just might, because it doesn’t have such a high concentration of it. If you try it, use a tablespoon or two less than the full cup. And please let me know how it comes out! I just finished baking these delicious cookies! YUM! I actually ended up using margarine but my sister made them today with oil(a little less than a cup, as you reccomended). She said they came out perfect! We are all enjoying your fantastic recipes and the gorgeous pictures that accompany them! Thank you! Easy to see why these don’t last long enough to be photographed. Glad you were able to snap a few shots of this batch before they disappeared. 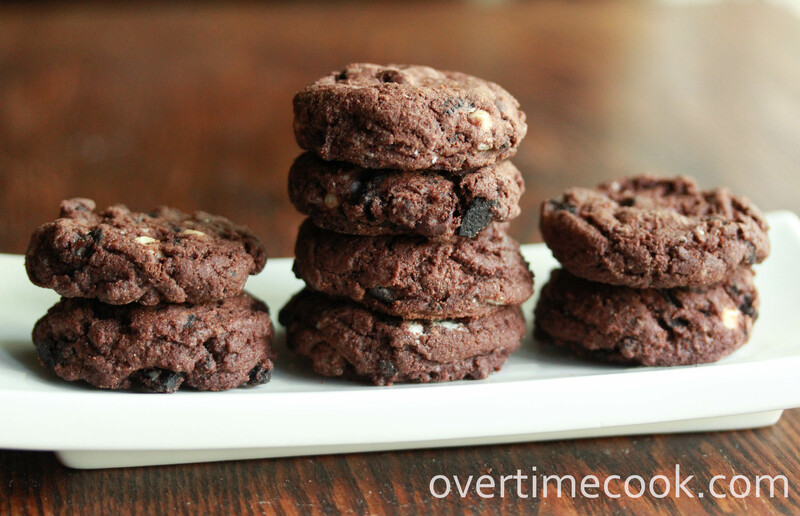 I love all the chocolate in these cookies!! They sound and look amazing! They look GREAT! A creative and great idea of adding oreo to the batter. Now, that’s my kind of cookie! Yum!!! My coworker made these off your site yesterday on the fast day, and brought in a few for me to sample. They are insanely awesome! So I made them for my DH and myself and he LOVES them. Thanks so much for the recipe. They look yummy and I’m sure they are. All your recipes are so user friendly and always come out good! Can’t wait to try them! Made these tonight and all my family absolutely loved them! Thank you!